In her long career, Helen Thomas walked a tightrope. She was part of Washington’s journalistic club yet an outsider who asked unwelcome questions. When she was tossed out of the club in 2010 over a careless remark about Israel, she said she cried for days – and had few defenders. But one was Lawrence Davidson. Helen Thomas, who died on July 20 at the age of 92, was the first woman journalist to cover the White House and did so for an unprecedented 50 years. She lasted in that job despite always asking the tough questions. It was a glorious run besmirched only late in her career by opportunistic attacks by Zionist American ideologues. 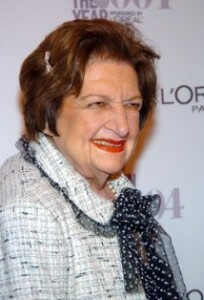 Helen Thomas was the most respected of the White House press corps. However, she made a mistake the other day of wearing her feelings on her sleeve, so to speak, on a topic of deadly political sensitivity. She said out loud that the Jews should “get the hell out of Palestine” and return to Europe. Palestine is “not German, it’s not Polish” she added. Unfortunately, the whole thing ended up on a YouTube video. Predictably, the American Zionists jumped all over her. Several former White House operatives, who may have resented Thomas’s hard questioning of their bosses, were at the front of this charge. The way the Israelis behave they have no need of Helen Thomas to “delegitimize” their country. They are doing a fine job of that on their own. Thomas’s remarks came in the aftermath of a piratical attack on the Gaza Aid Flotilla, during which Israeli commandos murdered nine aid activists on the Mavi Marmara. Acting as they do, the Zionists really have little legitimate cause to get angry at other people’s anger. Thomas’s remarks were obviously made in a mood of anger and frustration. We all make statements during fits of anger most of which, thankfully, do not end up on YouTube. But we also know that most of the time these statements do not reflect our otherwise realistic and level-headed point of view. I once heard a respected Middle East historian, delivering a talk at an annual conference of the Middle East Studies Association, say that the world would be a better place if Israel broke off from its geographical position and slid to the bottom of the Mediterranean Sea. Was this man a bigot? No he was not. He was Jewish. And he was not a “self-hater.” However, he was angry. Given her 50-plus years of honest and penetrating reporting there is no reason to doubt that this last statement represents the sober Helen Thomas – when not confronted with horrific Israeli behavior. The accusations of bigotry and the calls for the ruination of her career are way out of proportion and, when coming from Zionists such as Fleischer, Glick and Mariaschin, they are undoubtedly opportunistic. Now, since we are on the topic of bigotry, let’s consider the behavior of the Zionists in this regard. After all if one labels their critics as bigots, one should take a look at the basis for their criticism. The bitter truth is that Israeli Jews have spent the last 65 years systematically discriminating against Israeli Arabs and, as far as the Palestinians of the Occupied Territories go, they have set up a system of control that smacks of apartheid. A recent survey of Israeli Jews shows that a good number of them do not want Palestinians as neighbors or allowed to live in the same apartment blocks as they do. Israel’s school textbooks have purposely eradicated the Palestinian history of the place they now call the Jewish state. But freedom in Israel is too often seen as a strictly ethnocentric privilege. This is not to say there are not fair-minded and humane Israeli Jews who know that there is something seriously wrong with the society they live in. There are. They are just a too small minority. In other words, Israel, as now constituted and operated, is a state of active or passive bigots. That conclusion is based on evidence (evidence backed up by most of the world’s human rights organizations, including those in Israel). That being the case, I assert that Israel today is a racist place and should be transformed from a “Jewish state” to a democratic secular state, a state where all its citizens have equal rights. That does not require all of Israel’s Jews to go back to Europe, or to be drowned in the eastern Mediterranean Sea. It just requires the destruction of the ideology of Zionism. If the folks at B’nai B’rith get hold of this I will bet dollars to donuts that they would have conniptions and call me an anti-Semitic bigot. That seems to be the way it goes in our world of double standards.